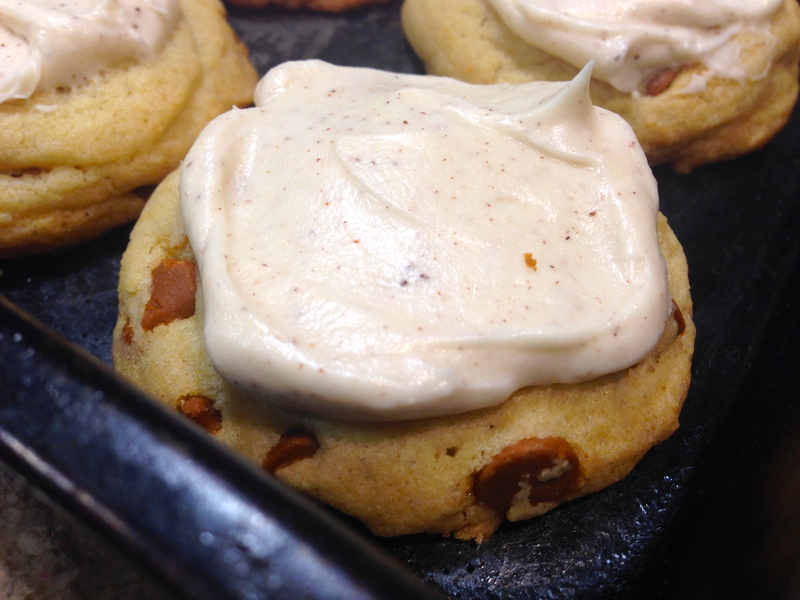 cookies – You Betcha Can Make This! Are you ready for a little Summer melt in your mouth goodness? Well here’s something that fits the bill. 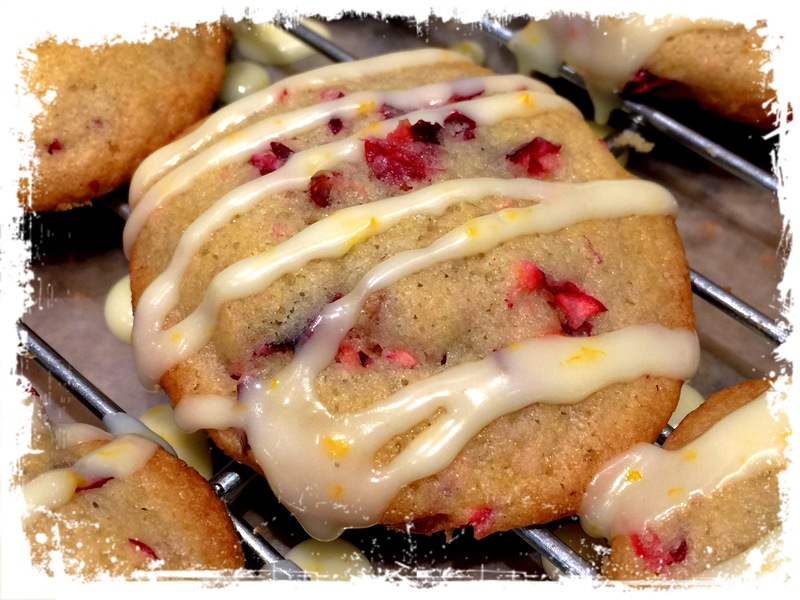 During the dogs days of summer you want something light, cool, refreshing… and these tasty morsels are like have a glass of lemonade in a cookie. The ingredients in the recipe are a little unusual. For instance, you don’t use any eggs just butter and lemon juice – you use powdered sugar in place of granulated sugar – and you mix the flour with cornstarch. Sounds a little strange but the result is what, as a child, I called sand cookies. And although sand cookies doesn’t sound very appetizing, it was my term for cookies that literally melt in your mouth. The combination of ingredients in this recipe creates a melt in your mouth consistency that is amplified when you ice them with the lemon frosting. All I can say is yummo! Lesson Learned 1 – Make sure you chill the dough: The consistency of the dough is not like most cookies – it will be softer and stickier. It’s important for the dough to chill in order to form the cookies and bake them off. Divide the dough in half and make two eight inch logs. Cover the logs in plastic wrap and refrigerate for up to two hours. My dough was nice and firm after an hour and a half, so check your dough at that point to see if it is ready to go. These cookies do not have a lot of binding ingredients (there is some butter but no eggs) and so they are more delicate than others. Basically that is what gives them their melt in your mouth consistency. So when they are still warm they can easily break apart. Be very careful when removing them from the baking sheet to the cooling rack. Also be careful when icing them. You can have a love-hate relationship with these cookies. You love the consistency as they flake apart in your mouth but they can also do that in your hand if they are not handled with care. Just take your time with them. These cookies are worth all the care you can give! Lesson Learned 3 – Chill the cookies once you’re done: I found the best way to enjoy these cookies is when they have a slight chill. The flavor is so light and with the chill it creates a cooling Summertime treat sensation. You’ll find that you can’t eat only one of these flavorful bite size morsels. I guarantee they will be a hit! Lesson Learned 4 – I used yellow food coloring in the frosting: I used yellow food coloring in the frosting but it’s not necessary. I found it gave the cookies that special look and we all know we eat with our eyes first. I used 3 drops and it created this beautiful lemony color! In a medium bowl beat together the butter and sugar until combined. Beat in the lemon juice. In another bowl whisk together the flour and corn starch. Gradually beat the flour mixture into the butter/sugar mixture until combined. Divide the dough in half and shape into two 8 inch logs. Cover the dough with plastic wrap and refrigerate until firm – approximately 1 1/2 – 2 hours. Unwrap the dough and cut it into 1/4 inch slices. Place slices 1 inch apart on an ungreased cookie sheet. Bake for approximately 10-12 minutes. Gently remove the cookies from the pan onto a cooling rack. Cool completely. For the frosting, beat together all of the ingredients. Spread over the cookies. Chill and serve. Lately I seem to be on a “sweets” kick with my posted recipes and even though I do have some savory ones in the queue I moved this one to the top simply because it it just too good. Many of you know that I bake a variety of cookies at Christmas time so normally during the year I don’t venture a lot into cookie making. But I had to try this one and it was so good that my husband would not even let me give any away. I had to freeze them so he could eat them all. When I make cookies over the holidays I have an unwritten rule that I try one new recipe every year and phase out one recipe. That way I always experiment and I keep the cookie making manageable. I am definitely adding this recipe to the 2017 list but will still have to find another recipe to be the “new” one since technically this one is no longer new. But I am really excited about the recipe. 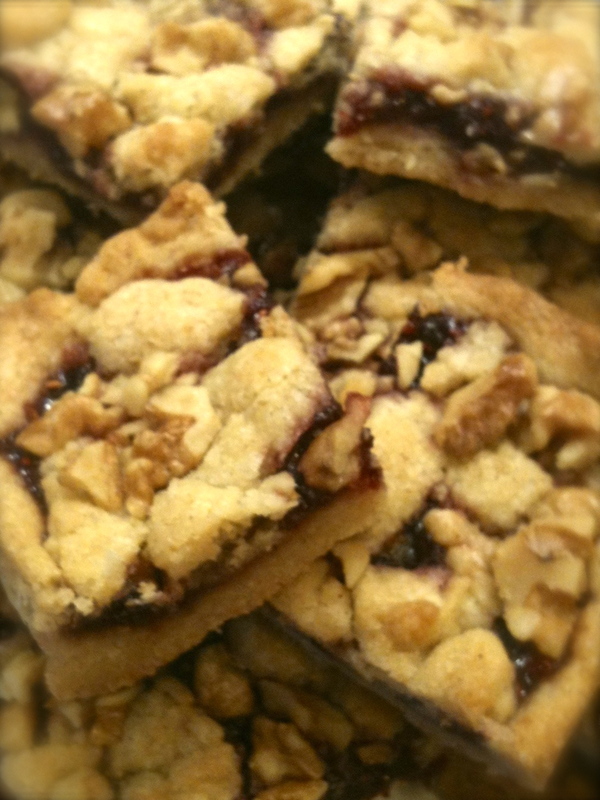 Lesson Learned 1 – Be gentle when mixing the blueberries into the dough: You don’t want the blueberries to break. If they do you will wind up with blue cookies. So be careful when folding them into the dough. Do that at the very end. I also suggest adding the blueberries in a couple of batches. The dough is pretty dense and if you pour the blueberries in all at once chances are you won’t get them incorporated into all of the dough and wind up with some cookies without blueberries. Fold them in carefully and in a couple of batches and you should be just fine. Lesson Learned 2 – These cookies really spread: Don’t roll the dough in too big of a ball as these cookies really spread. And make sure you have enough room between each one so they don’t bake on top of one another. I would roll them into about a 1 inch ball and put two inches between each ball on the baking sheet. Lesson Learned 3 – Remember blueberries stain: Blueberries are wonderful but they will stain and when they do it is virtually impossible to get rid of the stain. So here are a couple of tips to prevent any staining. First line your baking sheet with parchment paper. That helps in two ways. These cookies are very gooey and will stick to your baking sheet. Not a problem with parchment paper. Also when blueberries bake they pop and the parchment paper prevents them from staining your baking sheet. Also be careful when you are cooling the cookies and the blueberries may still be “leaking”. I cooled mine on a wire rack and then transferred them to a paper plate. That way I didn’t have to worry about staining any dishes as well. Lesson Learned 4 – These cookies take a long time to bake: On average these cookies take about 14 minutes to bake depending upon how big you make them. In my first batch I rolled the dough into somewhat larger balls and that batch took about 20 minutes to bake (keep in mind I also live in high altitude and everything takes longer to cook here). Once I got the size of the balls down pat it took anywhere from 14-16 minutes, which is a lot for a cookie. You know the cookie is done when you see it begin to lightly brown around the edges. The center of the cookie may still look pale, but that’s ok. Don’t over bake this cookie. If you do you the cookies will be way too crunchy. Lesson Learned 5 – Let the cookies somewhat cool on the baking sheet: These cookies will be very loose when you take them out of the oven. If you immediately try to put them on a cooling rack the cookies will break apart. Give them about 4-5 minutes to cool on the baking sheet before you put them on the cooling rack. The cookies will need to set a little before you can move them. Don’t worry about doing this. Since your baking sheet will be lined with parchment paper the cookies won’t stick and will transfer easily to the cooling rack once they’ve had a chance to set. I can’t say enough about how delicious these cookies are. I know if you make them they will become a household staple. You’ve got to try these cookies. And as always, please let me know how they turned out for you. Enjoy! Whisk together the flour, baking powder and salt. Set aside. In a large bowl cream together the butter and sugars. Beat thoroughly until very creamy. Beat in eggs one at a time. Beat in the vanilla. With a wooden spoon add the flour mixture to the butter mixture and stir to combine. Add the oats and stir to combine. Last fold in the blueberries in a couple of batches being careful not to break the blueberries. 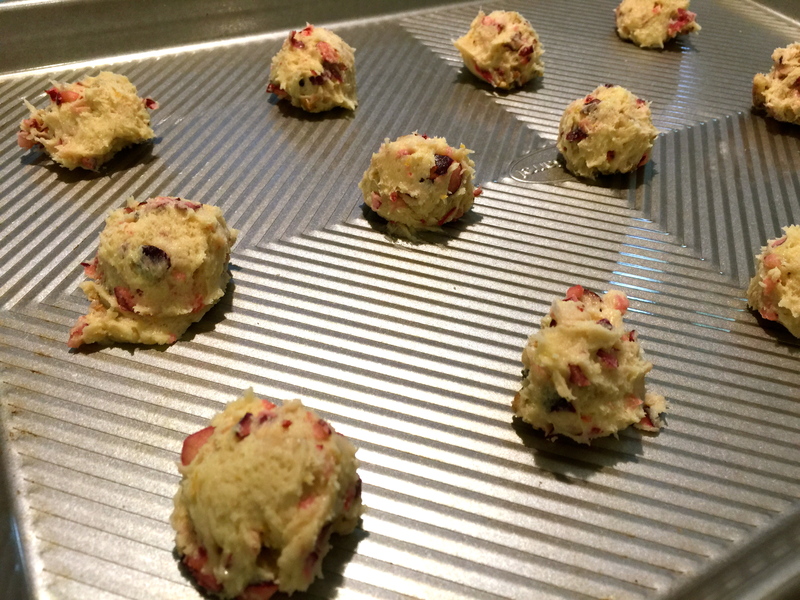 Roll the dough into one inch balls and place on the baking sheet, leaving approximately two inches between each ball. Bake for 14 minutes or until the edges start to turn brown (the center of the cookie may still look light and that is ok). Remove the cookies from the oven and let them set on the baking sheet for 4-5 minutes. Remove the cookies from the baking sheet to a wire rack to finish the cooling process. Combine the ingredients for the glaze. You may find you need a little more powdered sugar depending on how thick you want the glaze. If the glaze is too thick add a little more lemon juice until you get the desired consistency. Drizzle the glaze over completely cooled cookies and let the glaze harden. Store cookies in an air tight container or freeze them. It’s cranberry season, my favorite time of year. 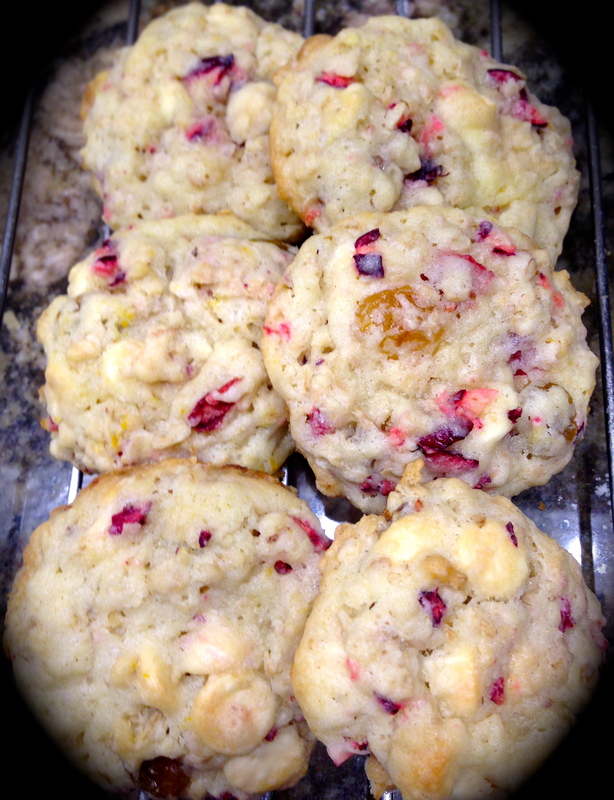 I love cooking and baking with cranberries. Their tartness adds zip to both sweet and savory recipes. I especially like them in cookies. 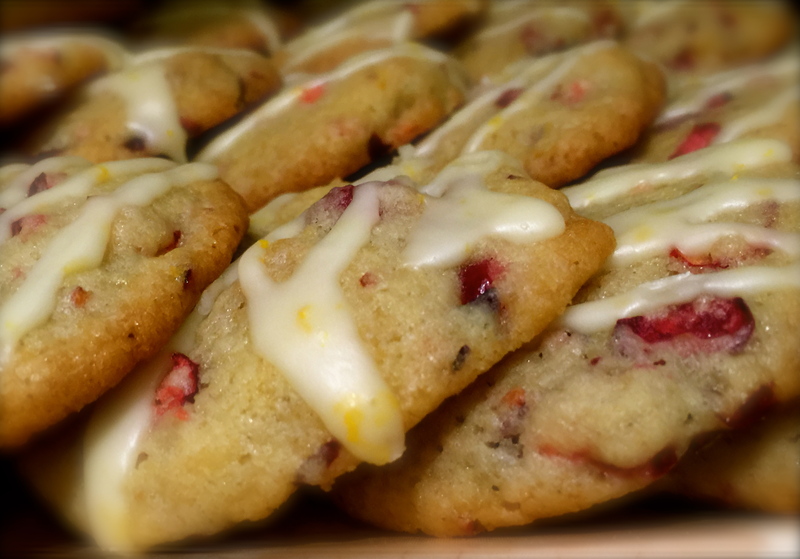 I think they balance out the sweetness in cookie recipes and add a festive flavor. Now need I mention that it is also getting very close to holiday baking season, and every year I try out at least one new cookie recipe. 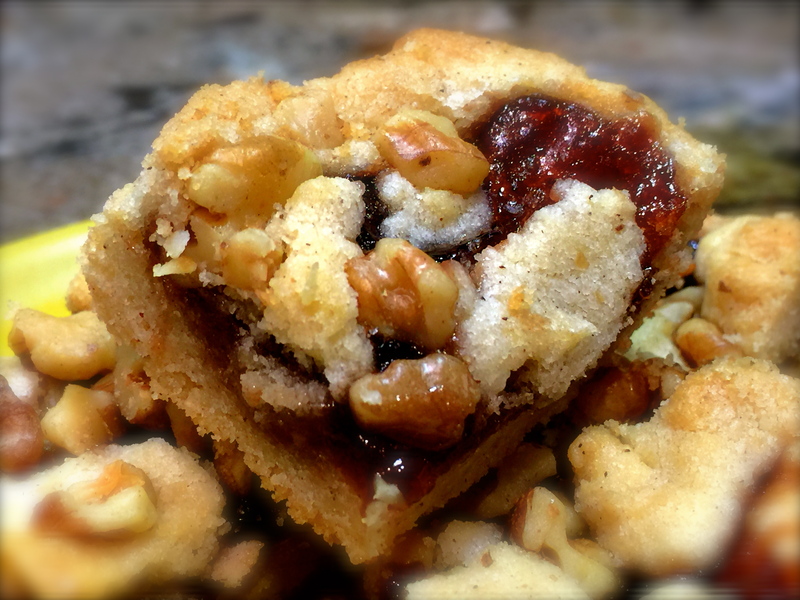 I saw a version of this recipe in an Allrecipes magazine and tweaked it not only from an ingredient perspective but also to adapt it to high altitude baking. High altitude baking can be tricky and unless you purchase a cookbook specifically written for high altitude baking you are most likely using ingredient amounts designed for sea level. The higher the altitude the lower the air pressure which makes it difficult for the baker. Baking depends on specific interactions of various ingredients such as flour, leavening, fats and liquid. Those interactions change with a change in air pressure. And to make matters worse, baking at 3,500 feet is different from baking at 5,000 feet and as you continue to rise in elevation the trickier it gets. I live at a 5,000 feet and have done a lot of research into how to adapt recipes for that elevation and still have some baking failures. But the more you do it, the better you get at it. 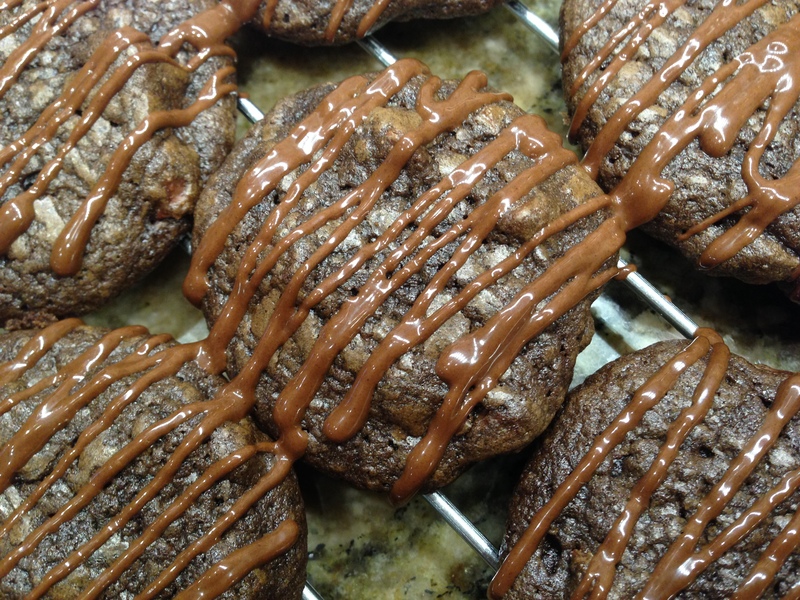 The additions to this recipe are specifically designed for baking these cookies at 5,000 feet. I played around with the ingredients and I nailed it! But since many of you are probably at sea level I will use sea level amounts as the base and note what needs to be changed for high altitude. Lesson Learned 1 – Use the juice from fresh oranges: Fresh ingredients are always the best. 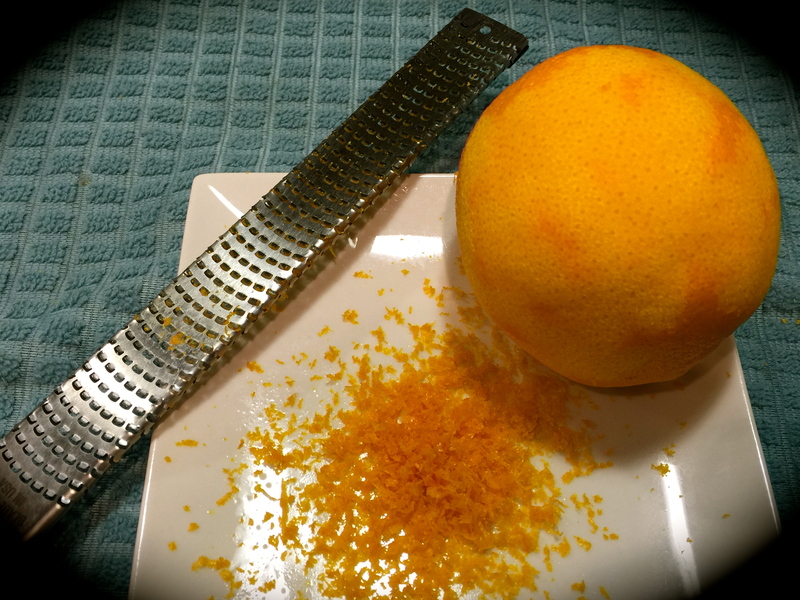 This recipe requires both orange zest and juice. Don’t take the easy way out and use bottled orange juice. Plus take a look at the amount of sugar in your orange juice. It’s crazy the amount of sugar there is a most juices. It can be anywhere from 10 to 30 grams. That’s a lot of sugar. Use fresh juice. Any small way that you can control the amount of sugar in anything you make is a good thing. Lesson Learned 2 – Use a cookie scoop to ensure even amounts of cookie dough: When I was growing up most cookie recipes would say drop the dough in rounded teaspoons or tablespoons onto the cookie sheet. That wasn’t very precise and you want to make sure you can, to the best of your ability, make each cookie the same size. That way every cookie will bake evenly versus having some baked and others raw or burnt. These days you can purchase what looks like a small ice cream scoop to make the cookie dough virtually the same size on your baking sheet. Working with them can be a little tricky so here is a helpful hint: spray the inside of the scoop with baking spray before scooping any dough. That way the dough will release more easily. I found that even with using baking spray the scoop gets pretty gummed up after scooping out a dozen or so cookies. Once you’ve filled your baking sheet, put your dirty scoop into a glass of warm water. When you’re ready to scoop out more dough, take a paper towel, wipe the inside clean and spray it again. This may sound like a lot of work but the results are evenly sized, evenly baked cookies. Open the plastic bag and put it in a tall drinking glass, spreading the bag open as widely as you can inside the glass. Now you have an easy way of pouring the glaze into the bag and both of your hands are free to do this. Snip only a very small portion off of one of the corners of the bottom of the bag. That way you’ll have a manageable stream of glaze when decorating your cookies. Put a sheet of wax paper under a cooling rack and put your cookies on the cooling rack before glazing. That way clean up will be a breeze. Just free flow the glaze over your cookies. You can do each cookie individually or do one long strip back and forth over a row of cookies. Have fun with it. Let the glaze set before storing them. Touch the glaze and if feels firm then you’re ready to store them. 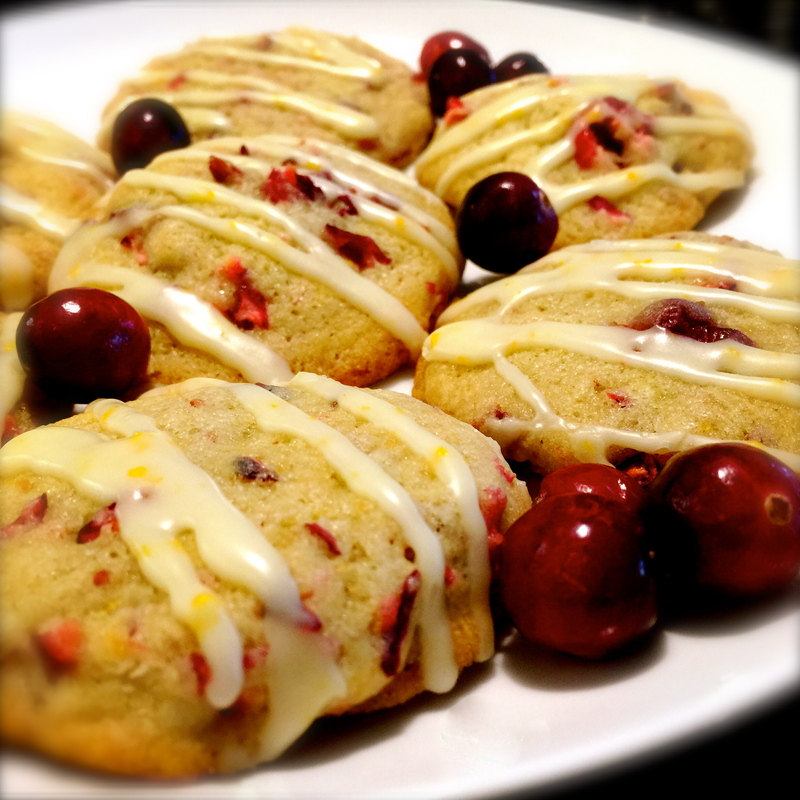 These are fabulous cookies and perfect for a holiday get-together. You really should try these and let me know what you think. Enjoy! Preheat oven to 375. Cream together butter and sugars. Beat in egg until thoroughly combined. Add zest and juice and combine. In a separate bowl sift together flour, baking soda and salt. Add in batches to the butter/sugar mixture and mix until combined. 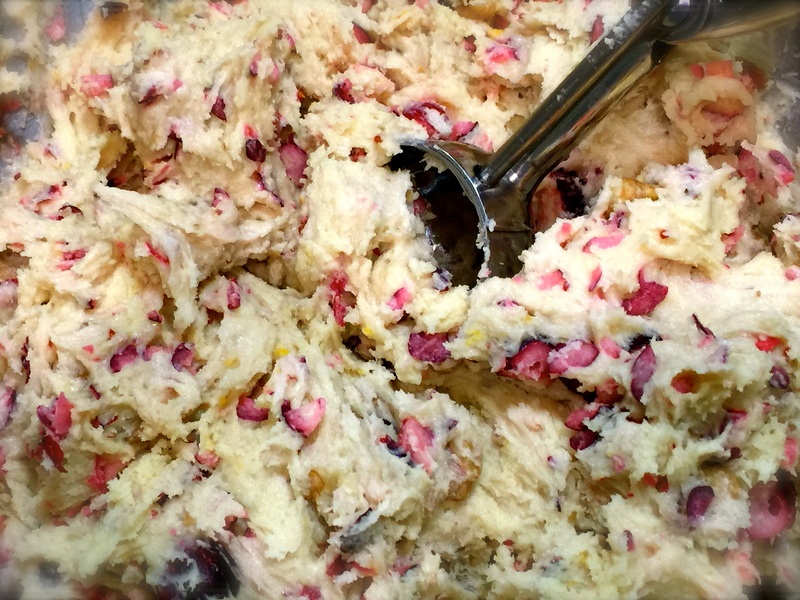 Stir in the cranberries and walnuts by hand. Drop dough in rounded tablespoons (the cookie scoop will do this perfectly for you) two inches apart onto an ungreased cookie sheet. Bake for 12 – 14 minutes (mine baked in 13 minutes – sea level baking on average takes less time). Transfer the cookies to a wire rack to cool. For the glaze: combine all ingredients together. Drizzle glaze onto the cookies. Let the cookies stand until the glaze has set and then store. For many, many years the holidays have meant cookie baking time for me. And over the years I’ve made a wide range of cookies. About five years ago I established a goal of making at least one new cookie recipe each holiday season. The result has been a definite shift in the tried and true cookies I make each year. And it’s nice to see an evolution in my cookie baking. 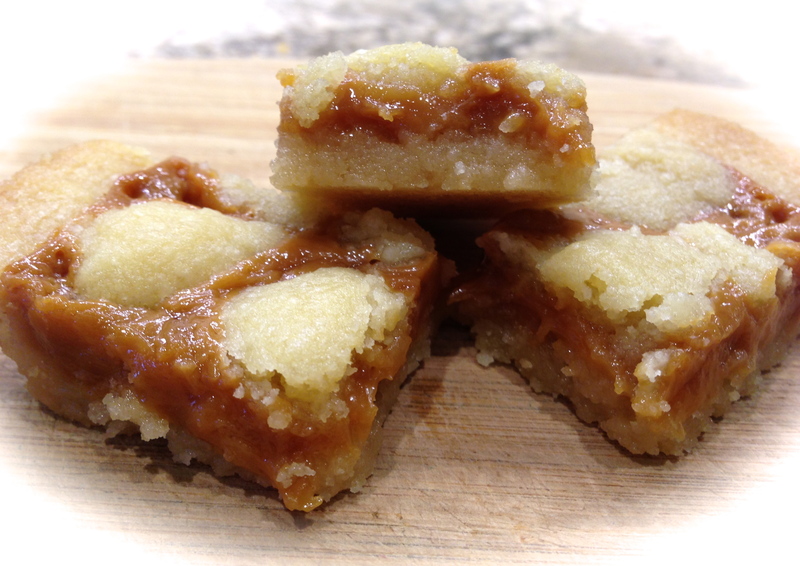 This blog is dedicated to one of the two new cookie recipes I made this year. Being that I work part time at Crate and Barrel I’ve been really challenged in making my goal of one new post a week during the holiday season. 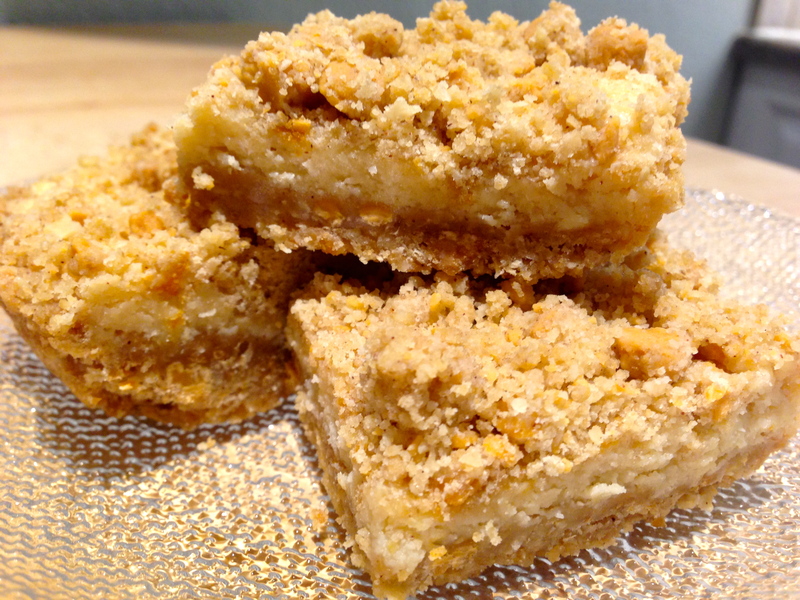 The other recipe (a recipe for oatmeal butterscotch cream cheese bars – also an excellent one) I will try to get posted within the next few days, especially for my readers who may not have started their baking yet. 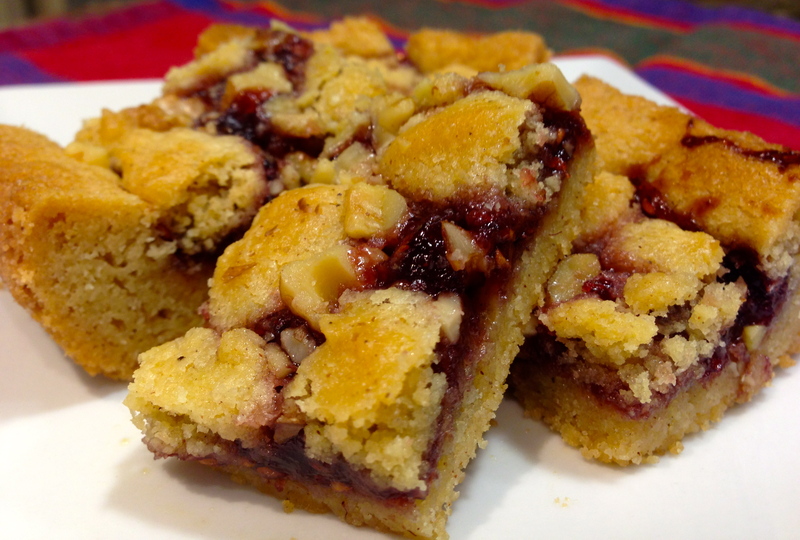 This blog will also serve as a one stop shop for some of my other favorite cooke recipes. I’ll provide a picture, name and the link to each below since I’ve blogged about them already. Look through them and see what might work for you. I guarantee you, they are all delicious. I made the peppermint twist cookies this year because I decided not to make spritz cookies and I wanted something on my cookie plates that had the colors of the holiday season. This is a delightful cookie and the combination of peppermint and chocolate truly is indicative of the holidays. It’s easy to make, colorful and delicious. Need I say more. 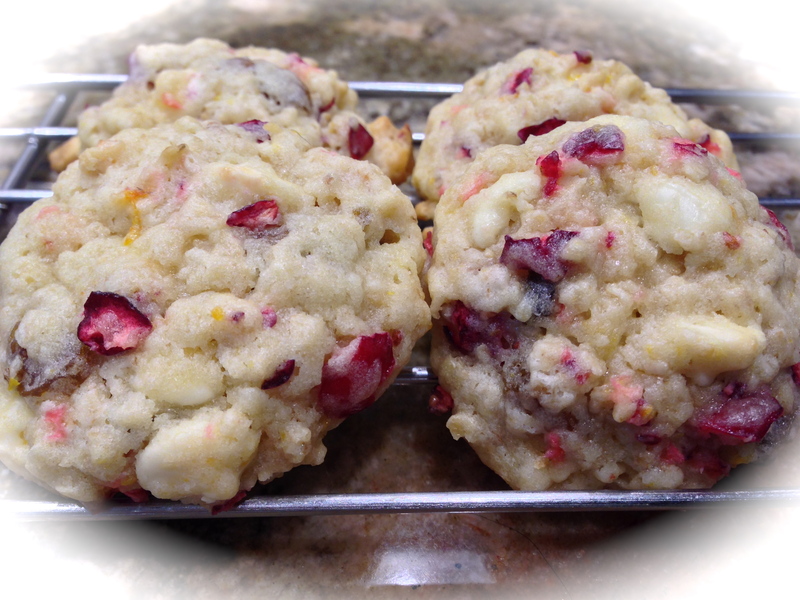 Recipe Rating – A: This is a flavorful, colorful cookie that will brighten up your holiday cookie platter. 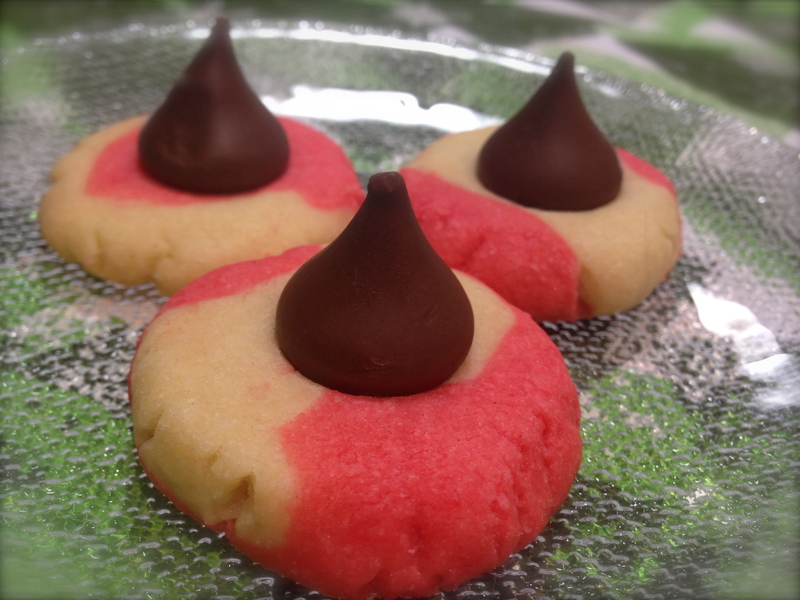 Just make sure your family doesn’t raid the bag of kisses before you bake the cookies like my husband did. They are a necessary part of making this cookie special. Lesson Learned 1 – Rolling out the cookies: This is definitely the most intricate part of making the cookies. Keep in mind that you will be combining to logs of dough into one so make sure the logs are thin enough. Once you have divided the dough and colored half of it with red food coloring, you need to chill the dough for at least an hour. Then divide each half of the dough into 4 equal parts and roll one of each color into a log 9 inch log. I have a silicone baking mat that was great to use in this process as it had measurements in inches on the top of the mat that helped guide me through rolling out the logs into the appropriate length. Once you do that, you need to loosely braid them together and roll them into a single log. This will elongate the log about an inch or two. Remember you want the circumference of the combined log to be as thick as each individual log. Take each individual piece and roll it into a ball and place on a cookie sheet. 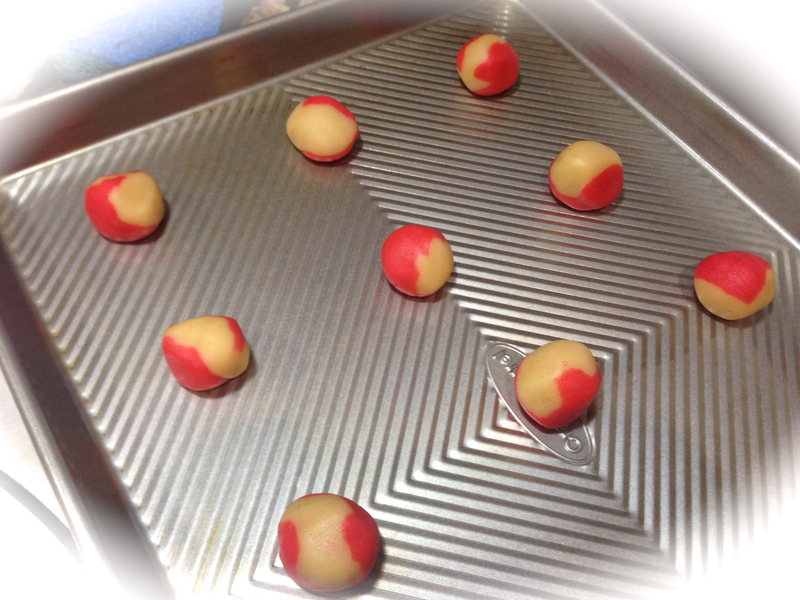 You will need to flatten each ball slightly with the bottom of a glass before putting them into the oven. That is definitely the hardest part of making these cookies. Lesson Learned 2- Make sure you unwrap the chocolate kisses ahead of time. 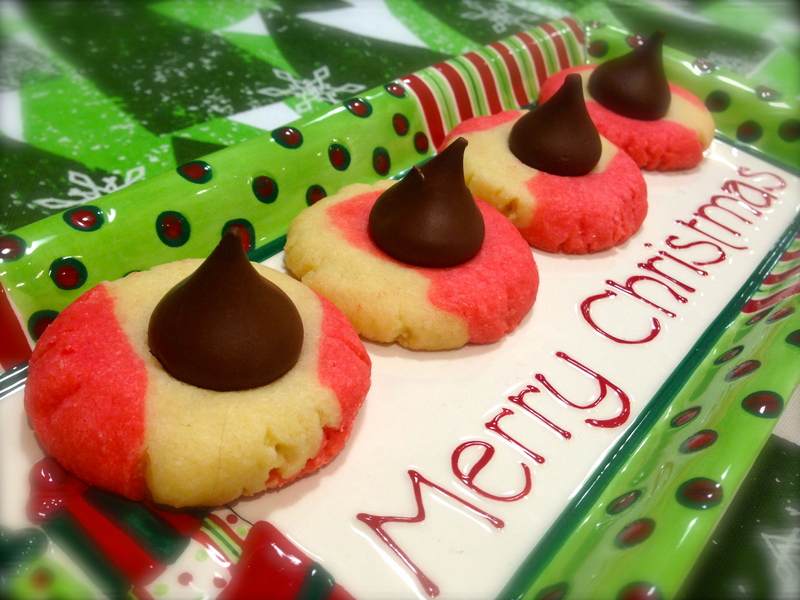 You only have a short window of opportunity to place the kisses on the cookies once they come out of the oven. Make sure you have them unwrapped so that you can get them on quickly. Then DON’T TOUCH THEM. 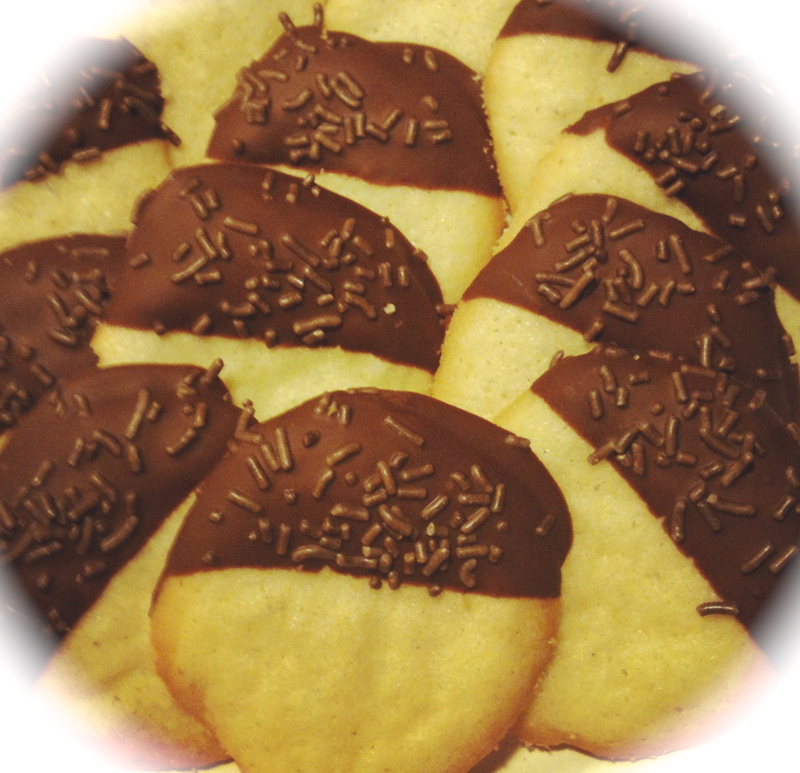 The warm cookie will cause the kisses to get very soft and they need to reset to retain their shape. Once the cookies have cooled slightly I put them on a baking sheet and stick them in the freezer for a few minutes to get the chocolate to set a little quicker. These cookies are fun to make, colorful, flavorful and will brighten up any holiday cookie tray. Enjoy! In a large mixing bowl cream butter and sugar. Add the egg yolks one at a time and blend. Add the extracts and mix well. Combine the flour and salt. Gradually add the dry ingredients to the wet ingredients. Mix well but do not over mix. Divide the dough in half. Tint one half of the dough with the red food coloring. Wrap both halves individually in plastic wrap and refrigerate for at least one hour. Preheat the oven to 350 degrees. Divide each half of each dough into four equal portions. Shape each portion into a 9 inch log. 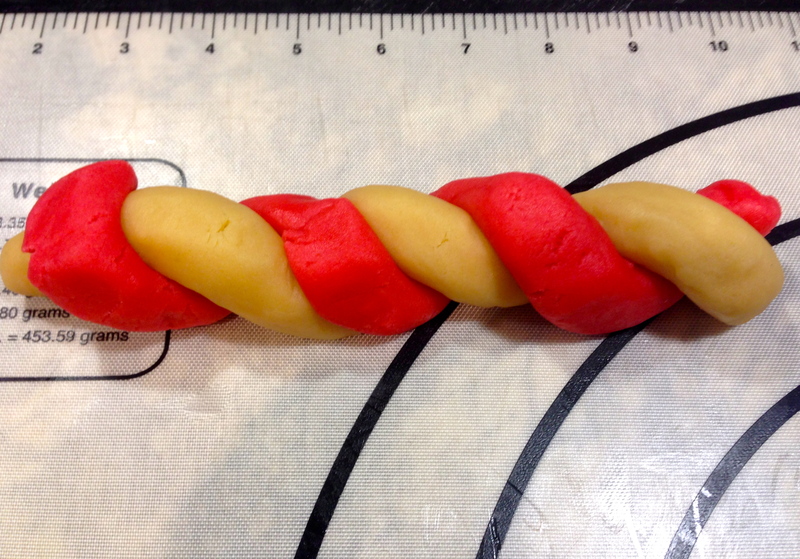 Place one red log next to one white log and gently twist them together to create on swirled log. (see picture above). Gently roll both together to create one log. Cut each log into pieces approx. 1 1/8 inches thick. Roll each segment into a ball and place on an ungreased cookie sheet. Flatten each ball slightly with the bottom of a glass. Bake at 350 for 10-12 minutes or until the edges are lightly browned. Press chocolate kisses into the center of each warm cookie. Remove to a wire rack and let cool. (once slightly cooled you can put the cookie on a flat sheet into the freezer for a few minutes to help the kisses set faster).